Image caption Mr Avery said hooking and landing the giant catfish was like "landing a small car"
A Somerset angler has caught a huge catfish weighing 245lb (111kg) while on holiday in Spain. Jonathan Avery, from Winscombe, landed the 8ft 3in (2.5m) fish on a fishing trip on the River Ebro, near Barcelona. Mr Avery said he had "never hooked anything like it before" and catching it had been like "landing a small car". 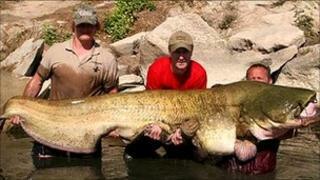 The current World Record for a wels catfish is 250lb 3oz (113.5kg). Mr Avery's previous largest catch was a 35lb 12oz carp in the UK. Mr Avery said of the catfish: "I knew it was a good sized fish straight away. "But it wasn't an epic fight and from hooking it to landing it only took about 10 minutes. "The local guides said it's the largest catfish ever caught in Spain and the biggest in the world caught by a Brit," he said. "And they were 99% sure it was the same fish that had been caught in 2006 weighing 220lbs. "It was definitely a monster but quite docile out of water and quite happy to pose for photos before we let it swim off." A Giant Mekong Catfish, caught in Thailand in 2005, is the biggest catfish ever caught in the world and weighed 646lb (293kg). In Britain, before records were suspended in 2000, the largest wels catfish caught weighed just 62lb (28kg).